A host of European teams have been linked with an interest in the striker, but the man himself shows no signs of wanting to secure a summer move. DANIEL STURRIDGE IS eager to stay and fight for his place at Liverpool amid intense speculation over his future at Anfield. Injuries have seen the talented forward’s progression stall as the Reds evolve under Jurgen Klopp, with a loan move to West Brom last season seen a springboard back to regular football. After six matches, no goals and another injury, however, Sturridge’s progression halted again as the Baggies were relegated from the Premier League. The England international is now fit again and being given a chance to impress in pre-season, with Sturridge having scored two goals in the 7-0 win over Chester. 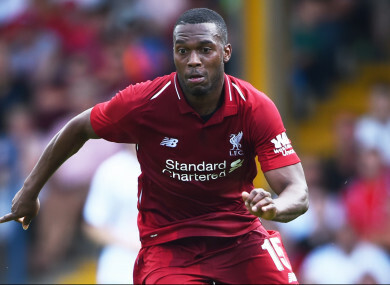 Despite being given opportunities to impress in the early matches of pre-season, Sturridge’s future remains uncertain and it is likely that he will be move on. Newcastle, Inter, Sevilla and Fenerbahce have all been credited with an interest, but the 28-year-old is determined to work his way back into Liverpool’s first-team plans. “I see myself staying at Liverpool, hopefully being part of the team week in, week out,” Sturridge said, as quoted by The Daily Mirror. Liverpool’s next game is against Blackburn at Ewood Park on Thursday, The Reds’ final match before they jet off for a tour of the US, and Sturridge currently cuts a confident figure. “Pre-season has started well for me and the team,” he said. “We have the tour to come where we face some great teams like Manchester United, Manchester City and Borussia Dortmund. Email “Sturridge: I want to play every week for Liverpool”. Feedback on “Sturridge: I want to play every week for Liverpool”.